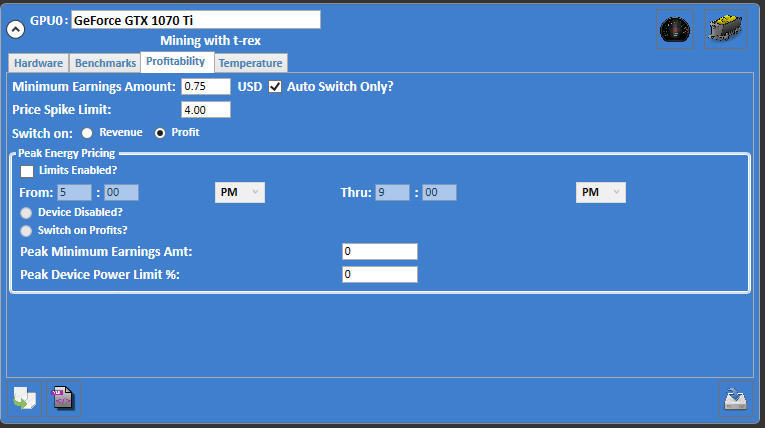 Hash Auger offers users a wide array of settings to customize the behavior of the algorithm switcher and profitability estimates. Many of these options are pool or GPU specific, allowing users to define very specific mining strategies. This document describes the various software, pool and GPU settings that adjust the behavior of the algorithm switching. The General and Advanced Config settings provide a set of options that alter the software's behavior for all pools and GPUs. The Refresh Rate in the Advanced software config options determines how often the software will get new price data from pools and sets the minimum time that Hash Auger will mine a specific task on each GPU. For example, the default rate is ten minutes, which means that Hash Auger will mine the current work for at least ten minutes before switching. The minimum switch rate is five minutes as most mining programs require an initial warmup period before reaching full efficiency which can reduce earnings when switching too often. Switching mining work causes a brief drop in productivity due to the time it takes to shutdown the current miner as well as the delay in the new miner reaching its full efficiency. Hash Auger uses a minimum switch percent to prevent a loss in productivity when the increase in estimated earnings is too low. The increase in estimated earnings of new work must be equal or greater than the Switch Percent in order for Hash Auger to change mining tasks. While the default value is 12% to cover the cost of lost productivity, users can adjust this percentage to accommodate their particular mining strategy. When this setting is enabled, Hash Auger will monitor the hash rate performance when mining on each pool. Factors such as the geographic distance between a pool's servers and the user's rig as well as the performance of the pool's servers can affect a miner's hash rate. Hash Auger's algorithm switcher will prefer pools with better hash rate performance when this feature is used. Hash Auger uses live benchmarking (as opposed to offline benchmarking) to ensure that benchmarks reflect real-world mining results for greater accuracy. With the revise benchmarks option, Hash Auger will continue to update benchmark data during mining so that benchmarks are even more accurate over time - which improves switching performance. 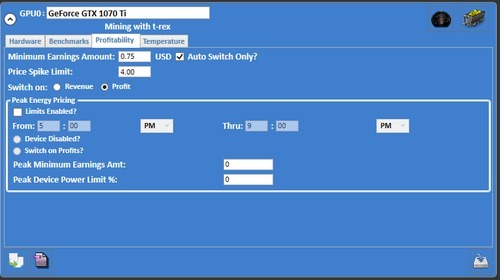 Hash Auger also includes a number of pool-specific settings that can be used define custom switching settings for most pools. Some pools such as NiceHash do not operate like the other pools available in the software and do not support as many customization options. 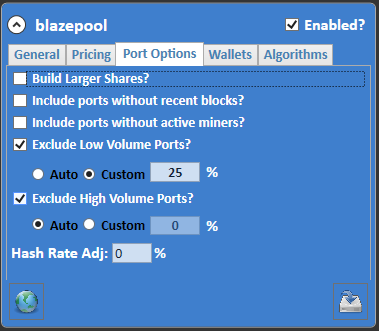 In Hash Auger, the pool settings that affect the algorithm-switching are divided among each pool's Pricing and Port Options tabs. The Pricing options modify how Hash Auger estimates earnings for that pool while the Port options determine which of the pool's algorithm or coin ports that will considered during switching. The Price Basis determines which pricing data that Hash Auger will use to calculate earnings estimates for a pool. Most pools provide both current estimates and 24hr Actual Prices; the current estimates more closely reflect current market and pool conditions but are also more sensitive to short-term price fluctuations. In contrast, the Actual Prices reflect each port's recent average performance which omits most short-term changes in value, but might also not include current price trends. Considering these factors, many miners prefer using a mix of bath sets of data to have estimates that are less sensitive to brief spikes and dips, but still reflect longer term price changes. Although it is recommended that users try different estimate to actual ratios for the price basis for each pool, most new users begin with 80% estimate so that the price estimate predominately reflects current values. 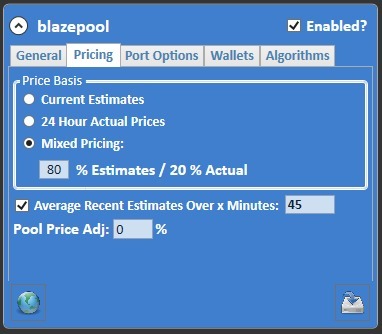 Users can define a default price basis ratio that will apply to all of a pool's ports on the Pricing tab. Advanced users may want to define custom ratios for specific algorithms or coins using the appropriate tab on the pool panel. Any custom ratio defined on that tab will override the pool's default price basis setting for that algorithm or coin. To further help decrease sensitivity to short term price fluctuations, Hash Auger can also average each port's estimates over a user-adjustable amount of time. Averaging the recent estimates helps the software avoid switching work due to an unusual jump in estimates that can occur after sudden changes in market or pool conditions. Finally, users can specify an adjustment percent that will be applied to all earnings estimates for a pool. This allows users to tune the price calculations to better fit their actual earnings from a pool or to prioritize pools. For example, users who prefer the consistency of Nicehash estimates to the more variable estimates provided by other pools may set a positive price adjustment for Nicehash in Hash Auger. This will make it more likely that the software will mine on Nicehash instead of another pool. Conversely, users can set a negative price adjustment to decrease the likelihood that a pool will be used unless the pool's estimates are significantly greater than other pools. Miners typically receive payouts from a pool's block rewards based on the proportion of shares that they submitted towards finding that new block; the higher the share percentage, the larger the earnings. The Build Larger Shares setting will cause the software to delay switching work if it estimates that the user's share in the current block is very small; this usually causes the user's share to grow over time and should result in higher earnings. One of the main benefits of joining a mining pool is to combine one's hash power with that of other miners to find blocks and receive rewards faster. However, some pool ports may not be actively mined. By default, Hash Auger ignores ports that do not have active miners as these ports are slow to pay out for most users. However, users with sufficient hash power or who want to mine specific coins regardless of their current activity may want to enable this setting. Similarly, Hash Auger also ignores pool ports that have not found a new block within the last 24 hours based on the theory that those ports do not have a sufficient number of miners. Users can include those ports for a pool by enabling this option. Low volume ports are ports that do not have many miners. Some users prefer to exclude these ports as the total hash rate on these ports is usually insufficient to find new blocks and receive rewards on a consistent basis regardless of earnings estimates. The Auto setting will exclude any ports where the rig's hash rate is a large share of the port's total hash rate. Users can define a custom limit and the software will ignore any port when the rig's combined hash rate is a greater percentage of the port's total hash rate than that limit. Algorithm and coin specific limits can be defined on the appropriate tab. Conversely, Hash Auger can also filter pool ports that are currently oversubscribed. Mining on a port with too high of a hash rate often results in reduced earnings because those ports have a high difficulty in finding new blocks and all rewards are shared among a large number of miners. With the Exclude High Volume Ports setting enabled, the software will ignore ports where the rig's hash rate is only a small fraction of the total hash rate - concentrating mining on more profitable algorithms and coins. As with the Exclude Low Volume Ports settings, users can define a custom limit and the software will ignore those ports where the rig's share of the port's total hash rate is smaller than the specified value. A default setting can be defined for a pool on the Port Options tab while algorithm or coin specific limits are defined on the corresponding tab. Finally, there are a few options on the Profitability tab for each GPU that customize how algorithm switching works with a device. The Minimum Earnings Amount prevents a GPU from being used when it is not profitable to do so. Simply enter the lowest estimated earnings using your selected currency and Hash Auger will ignore any work with earnings estimates below that amount. If no work is higher than this amount, the software will suspend mining on that GPU until earning estimates raise above that level. Sometimes pools will provide extremely high and most likely inaccurate price estimates for some coins due to network or market data problems. Entering a Price Spike Limit will prevent Hash Auger from switching to these unprofitable coins when most other algorithm switching programs will respond to lucrative, but flawed pricing. As with the Minimum Earnings Amount, the Price Spike Limit is entered in the user's currency. The software will ignore any estimates that are greater than the specified amount. Users enter a value based on their tolerance for risk that a certain price point is accurate; a general recommendation is 150 - 200% of a GPU's average daily earnings. For example, if a GPU earns $2 a day, a Price Spike Limit of $3.50 to $4.00 can be used to respond to legitimate increases in value while still avoiding questionable spikes. Hash Auger's default behavior is to switch work based on revenue or the total value of the work without regard to electricity costs. However, users that prefer to switch based on estimated profits can change this setting. When switching based on profit, Hash Auger subtracts electricity costs from the estimated earnings and selects the most efficient, rather than the fastest, miner for each algorithm. In order to switch based on profits, users must first enter their cost per Kilowatt Hour in the selected currency. Preferably, this is done before benchmarking so Hash Auger can calculate the efficiency and cost of mining each algorithm with each miner that supports it. As with hash rates, electricity usage is revised from data collected during mining for greater accuracy.